If you are a blogger then you might be sharing your blog post on LinkedIn, Facebook, Twitter & Reddit but not getting any profit from this social sharing. I suggest you use Pinterest, utilizing Pinterest you can generate quality traffic to your blog. Pinterest is a social media with 9.30 score in Moz Rank, 98 DA(Domain Authority) score & 93 PA(Page Authority) score. Pinterest is profitable for a blogger since it generates five times more money per click than Twitter & 28% more than Facebook. An impression in Google Adsense per page views is most higher than Facebook & Twitter. You can utilize the power of Pinterest to sell affiliate products. Most of the Digital Marketers & bloggers use Pinterest because nowadays people are using Pinterest as a Search Engine to buy products. Not only affiliate promotion, but you can also use Pinterest to promote your Brands. By creating different business boards on Pinterest, you can promote your business with eye-catchy infographics & description. 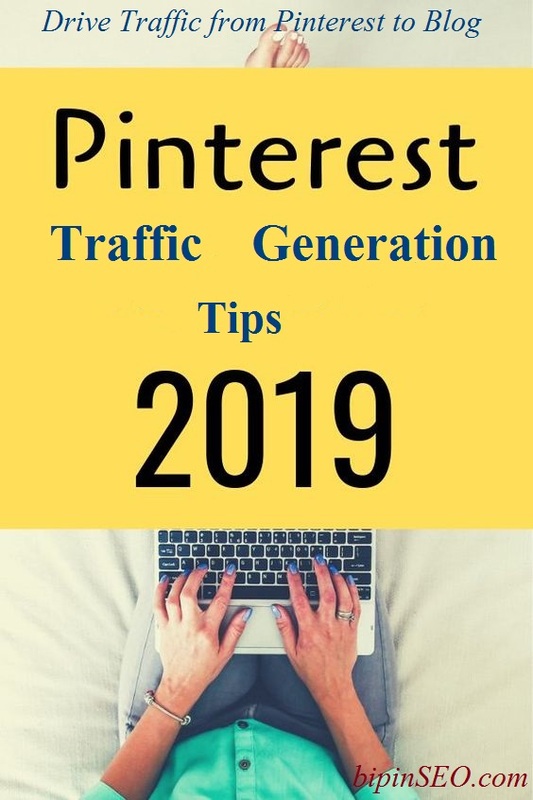 In my case, Pinterest has Skyrocket Traffic by 40%; in this post I will share 6 Pinterest traffic generation tips with you. You will learn how to utilize the power of Pinterest marketing in your social media strategy to drive 100+ daily traffic to your Blog or Business brand with more sales & more Ads clicks. With a business account on Pinterest, you can utilize more features of Pinterest than a personal account. You can promote your blog on Pinterest with additional features such as Pinterest analytics, promoted pins, rich pins, a demographic result of a website & pins clicks. Fill out your business or blog name, website link, then select a business type. Click create a business account. Creating a separate board on Pinterest for your blog posts makes it easier for your Followers to follow your boards & find your blog post. Name each board as same to the category or title of the blog. 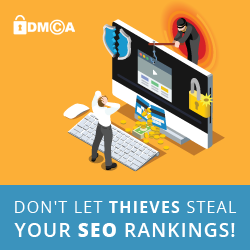 For example, if you have blog posts on the category "Make Money Online," "Drive Traffic," "SEO Techniques" then it would be better to choose a separate board for each category. Include Pinterest Keyword in board title to show up in Pinterest & search engines. Pinterest is a visual social media with tons of infographics & images. To drive traffic from Pinterest to your blog, you need to add eye-catchy stunning images in your pins. Images are used to capture the attention of a reader, with the help of clear & enjoyable glossy images you can rank Pins higher that drive traffic to blog from Pinterest. You need to add images of 600*1560 or 600*1260 pixel dimension for your Pinterest pins. Adding Infographics in your pins is much impressive than simple images. So add Infographics on your Pinterest Pins because they are more visual than simple text & summary of a blog post can be included, so the impression of Pins also increases. Include text also in your images to draw the attention of follower that generate traffic from Pinterest back to your blog. 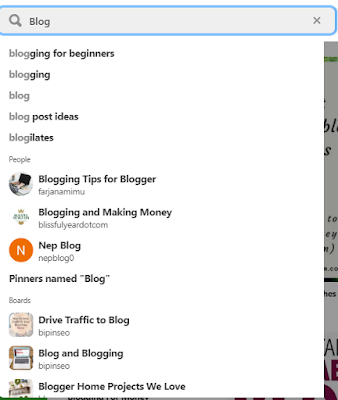 Not only for your blog post but also your Pinterest Pins, Keyword Research is essential for growing up higher in Pinterest that drive traffic to your blog. A report says "86% of Pinterest users use Pinterest while online shopping." So understanding higher potential keywords with search volume will be most valuable to your blog & business brand. Traffic generation from the Pinterest & brand promotion of business will be more beneficial with the Pinterest Keyword Research approach. Appropriate keyword research for your Pinterest Pins makes your Pins available among more customer. To find out appropriate keyword for your Pins, merely type a topic or word. You can see the most popular keywords or phrases associated with that topic like in Google. You can find out the most popular keywords, people & popular boards associated with that same topic. Type a topic or keyword & click on one of the Keyword suggested by Quick Search. Pinterest will guide you with appropriate popular Keywords below the search box. *You can use the Pinterest Keyword Tool to find out popular keywords. Engaging on Pinterest with your followers makes you a good social media marketer. If you want to drive traffic to blog from Pinterest Pins, then you need to be engaged on Pinterest by pinning good content with stunning images. Follow to other Pinterest user who is related to your blog or business & returns the follow to every follower. Pin regularly so your pins can be found in your Followers feeds. Pin good content of your follower to your board so your Pins can also be RePinned to their boards. Find people who RePin your Pins & follow them. To add good content on Pins, you must add a stunning image or infographic, with Title & Description. Add Pinterest Keyword in Title & Description & choose a board that matches with Keyword & Content. Tailwind is the secret of many blogger & Digital Marketing expert to skyrocket Pinterest reach. You can promote Pins with Tailwind tribes for free that will generate traffic from Pinterest to your blog. In Tailwind, you have to start by finding the right tribes to join. Tailwind tribes are like Pinterest board groups, but the benefit of Tailwind tribes is that you can collaborate & share good contents as per tribe guidelines. Tailwind Tribes are essential for every blogger since you will find a network in tribes with similar interest with niche related content. After signup, you will be allowed to enjoy and schedule 100 pins for free. How to begin with Tailwind? In the very first step, you have to signup to Tailwind with your Pinterest Account. You will be redirected to Tailwind control panel. To begin with Tailwind, you need to install a browser extension of Tailwind. When you install that extension a "Schedule" button will be displayed in the image on every blog. Search for famous Tribes on your blog niche and request for collaboration. Ok, this is the easy way to collaborate with other people in a network or tribe that will massively increase your blog traffic from Pinterest. To utilize the power of Pinterest marketing, be engaged on Pinterest with new Pins & followers. Try adding the "Pin it" widget on your blog, so your reader loves to Pin blog post in their board. 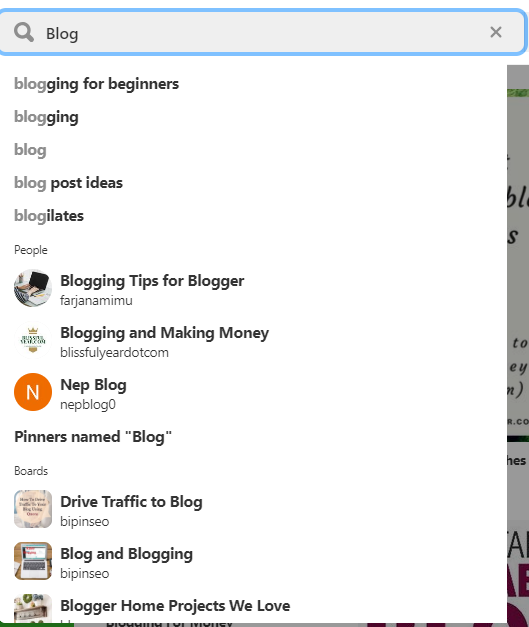 Create new Pins for old posts to keep your old blog posts alive by updating pins. Create multiple pins for a single post with different stunning images, title & description to reach more people. Use the six tips from this article to drive more traffic to your blog. If you know how to use Pinterest, then I am sure your Pinterest business account will generate more traffic & more sales. I recommend you to read different E-books of different social media experts to supercharge your Pinterest Marketing Strategy so you can have more Traffic, more Sales, & lastly, you can Build your Brand on the World's Hottest Social Network.